Get Bigger Arms in Minutes | Valet. These three moves are guaranteed to deliver results. 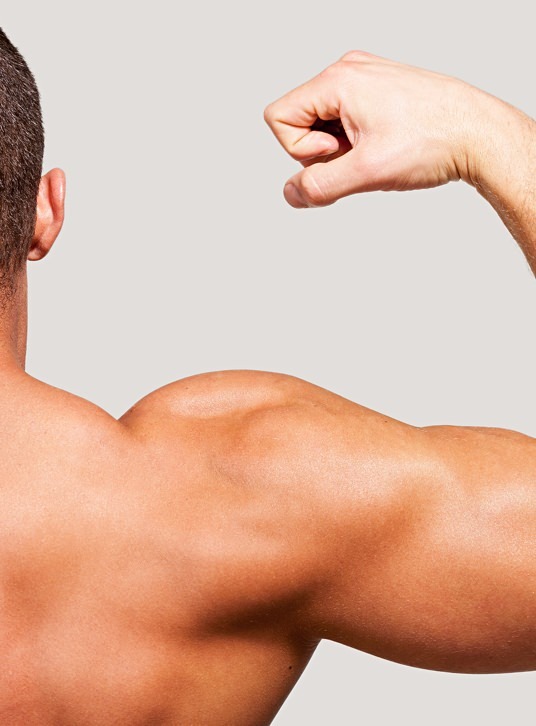 Want to develop stronger, more defined arms? The kind of vanity muscles that fill out the sleeves of a T-shirt or polo? Focus on your biceps, triceps and shoulders. This quick and easy-to-master workout guarantees bigger arms with all the right definition. And best of all, it only takes a few minutes. Known as a tri-set, you perform the three moves back to back with as little resting as needed for five minutes straight. Start out with five reps a piece, then each time you repeat the workout, try to do one more rep. You're sure to see fast results. Do five reps of each exercise as a set. How many total reps can you do in five minutes? Hold the dumbbells by your side, palms facing each other. This hand position will work the outer edge of your biceps. Without moving your upper arms, curl the weights up towards your shoulders. Pause, then lower to the starting position and repeat. Start with the weights over your head, with your arms straight. Brace your core and keep it tight throughout the exercise. Keeping your upper arms still, bend your elbows and lower the weights behind your head. Pause, then straighten your arms to return to the starting position and repeat. Hold the dumbbells in front of your legs with your palms facing your thighs. Steady your back and make sure not to rock your torso as you lift. Raise the left dumbbell out and upwards, while keeping a slight bend in your elbow, until your arm is a just above parallel to the floor. Pause, then lower your arm and duplicate the move with your right arm. These hex dumbbells have contoured steel handles that are etched for an extra comfortable grip and rubber coated ends to protect your floor. Easy but effective exercises to tone your chest and arms. Both are simple body weight exercises that pack a punch. But which provides more benefits?